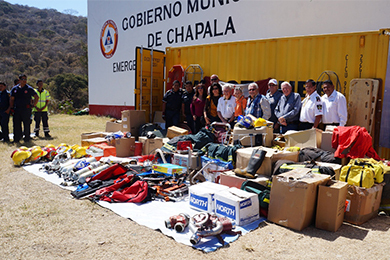 It was a long, hard haul, but the Lakeside Assistance Group and Canada’s Firefighters Without Borders have done it again, putting together their second shipment of second-hand outfits and equipment for donation to fire fighters in 40 Jalisco communities. A giant yellow shipping container sent out of Vancouver was unloaded in Manzanillo last week. The bounty of supplies was delivered to its final destination at the Chapala’s Protección Civil y Bomberos base at dawn on Friday, February 19. The full-to-the-hilt container was opened Sunday morning amid a modest celebration among local firemen and the group of local volunteers behind the project. Distribution of the goods has been going on throughout the week as fire station chiefs from various towns have arrived to pick up their share. Lakeside Assistance Group President John Kelly, American Legion Commander Tim Stern and Chapala Deputy Fire Chief Lorenzo Salazar previously visited each locale to determine priority needs. “Many of the fire stations have little more than manpower to work with,” Kelly says. “With no trucks and almost no equipment, some are literally using buckets to put out fires.” Helmets, boots, protective suits, air tanks, hoses and assorted rescue gear come as a godsend to the dedicated but hard-strapped bomberos. The container, donated by ATCO Structures and Logistics, will remain at Protección Civil y Bomberos headquarters for permanent use as a storage unit. Meanwhile, a third load of Firefighters Without Borders give-aways is ready and waiting for ground transport from Ontario to Chapala.